Tumbleweed Peepshow and CD Release party for Raman’s record ‘The Tides’ Season kickoff June 24th!! 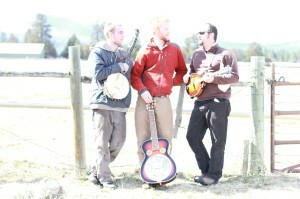 Tumbleweed Peepshow is a collaboration between three adept and artistic songwriters/instrumentalists. Their original songs reflect the wide-open space and dramatic effect of their rural and mountainous home in Sisters, Oregon . The group came together in 2013 when Benji and Raman independently moved back to Sisters, wh…ere they were raised and had played music together since they were 12. They quickly reunited with their old friend and musical mentor, Brent Alan, and a band was born. The three now bond over frequent jams and a love for artists such as Jackson Browne, John Prine, Hank Williams, Tim O’Brien and Darrell Scott. As a trio, they pull at the heart-strings and create a raw, soulful, bluegrass-infused sound with real life, acoustic stories and a groove you can move to. Posted by Angeline on May 11th, 2016 in Music & Art | Comments Off on Tumbleweed Peepshow and CD Release party for Raman’s record ‘The Tides’ Season kickoff June 24th! !